The fearless and highly skilled Swedish online poker giant Viktor Blom, Isildur1, has had a massive start on 2013 managing a $1,1 million profit in only the first three days of the new year. We remember the massive swings from the young swede during 2012, however it seems that he has improved his skills once again to take on the battle with the other online poker sites high stakes players without having the huge loosing swings. 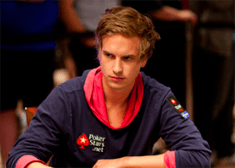 Another change we have seen is that Viktor Blom now has expanded his range of games he would play poker online. We have the last few days seen him hitting the high stakes at Full Tilt Poker for 2-7 Tripple Draw against Scott Seiver. After a 3,5 hour long battle between the two, Isuldur1 stood as the big winner with a $392,000 profit. Scott Seiver who actually, after the battle against Viktor Blom, is the second largest winner in the 2-7 Tripple Draw game since the re-launch of Full Tilt Poker. Many poker players expected to have seen Viktor Blom at the PokerStars Caribbean Adventure to defend his last year title in the $100,000 High Roller event, however Viktor has decided to not show up and rather focus on playing online poker instead.